As far as I know, my father's Aunt Fanny didn't have any child named after her, but, in keeping with our Ashkenazi tradition, she does have something that bears her name: the family recipe for butter cookies. We call them Fannies, because these butter cookies were her creation and somehow calling them Fanny's just didn't seem right to anyone but the English majors in our lives. I have made these cookies so often I can mix the dough and shape them without even looking at what I'm doing. My kids make them. My grandkids even make them. Fannies are the ultimate butter cookie. You need look no further to find a better one. But of course, not during Passover. Which got me to thinking that -- this recipe is so good, why not try a Passover version? After a few tries -- voila! Thank you Aunt Fanny. I named them after you too. Place the matzo cake meal, ground almonds, sugar and salt in the bowl of an electric mixer and mix on low speed for about a minute until the ingredients are evenly combined. Add the butter and mix on medium speed for about 3 minutes. The mixture will be crumbly. Add the egg yolks and vanilla extract and mix for another minute or so until a soft, uniform dough forms. Place the dough in the refrigerator for 30-40 minutes or until somewhat chilled and slightly firmer. Preheat the oven to 350 degrees. Take small chunks of dough and shape into balls about one-inch in diameter. Flatten the balls in the palm of your hands into disks that are about 1/4-inch thick. Place the flattened balls on ungreased cookie sheets, leaving some space between each cookie (they will spread slightly). Place a chocolate chip in the center of each dough disk (they hold better if you place the chips upside down). Bake for 10-2 minutes or until golden brown. In my world, Passover is not usually the brisket fest that is typical for so many of the other families I know. Our usual is turkey. Second night veal. That's because, growing up, when the Seders were at my grandma's house, and the crowd could be as many as 24 people, she always served a big turkey the first night. The second night, when we were a much smaller group, she would cook a batch of veal cutlets with a crunchy matzo meal crust. Frankly, I don't feel like frying up a whole mess of cutlets, so my Passover veal dinner will likely be breast of veal, one of my favorites meats to eat. I realize a lot of people think breast of veal is too down home for a festive occasion such as Passover. I don't agree. Look how beautiful this roast is! Golden brown skin, meaty bones, moist meat, savory vegetables to accompany. Looks impressive to me! And also quite good to eat, for Passover or otherwise. Preheat the oven to 400 degrees. Heat 2 tablespoons of the olive oil in a saute pan over medium heat. Add the onion and cook for about 2 minutes, to soften slightly. Add the mushrooms, garlic and parsley, stir and cook for another 2 minutes. Season to taste with salt and pepper. Spoon the vegetables into a roasting pan. 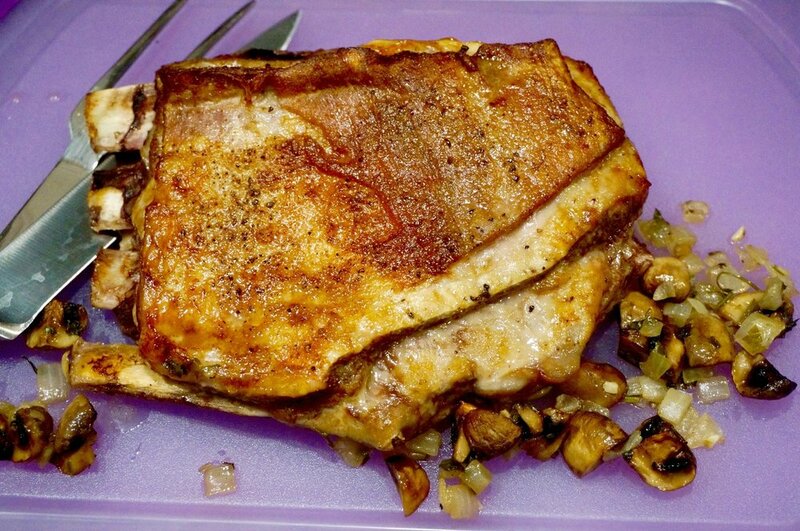 Place the veal breast on top. Brush the top surface of the meat with the remaining olive oil. Sprinkle with salt and pepper. Roast for 30 minutes. Pour the wine over the meat. Reduce the heat to 350 degrees. Roast for another 45-50 minutes, basting occasionally, or until the surface is crispy. Classic ratatouille is time consuming and labor intensive. Also fabulously delicious. Unfortunately, I don't have the time or patience to cook the authentic recipe these days. Especially not for Passover. Heat 3 tablespoons olive oil in a large sauté pan over medium heat. Add the scallion, garlic and chili pepper and cook, stirring frequently, for one minute. Add the eggplant and bell pepper and cook, stirring often, for 4-5 minutes or until the vegetables have softened. Pour in the remaining olive oil and add the zucchini (add more olive oil if the vegetables start to stick to the bottom of the pan). Cook for 3-4 minutes, stirring frequently. Add the tomatoes and basil and cook, stirring frequently, for 12-15 minutes or until the vegetables are soft and there is little liquid left in the pan. Season to taste with salt and pepper. I have been experimenting with new recipes using matzo farfel. That's because I always buy too much of it and then it gets stale and I throw it out. It can be difficult to find fresh matzo farfel in my neck of the woods (when it isn't Passover). But matzo farfel doesn't last, it gets stale quickly, so I have to use it up while it's fresh. Here's a good way: candy! Don't let the cayenne pepper put you off. That tiny bit of heat brings out the best in the chocolate. Preheat the oven to 350 degrees. Place the matzo farfel on a baking sheet and bake for 10 minutes, tossing the farfel around once. Remove the pan from the oven and let the farfel cool. Melt the chocolate. Add the farfel, almonds, cranberries, coconut, orange peel and cayenne pepper to the chocolate and mix to distribute the ingredients evenly. Spoon heaping tablespoons of the mixture into clusters on parchment paper or aluminum foil. Let set. 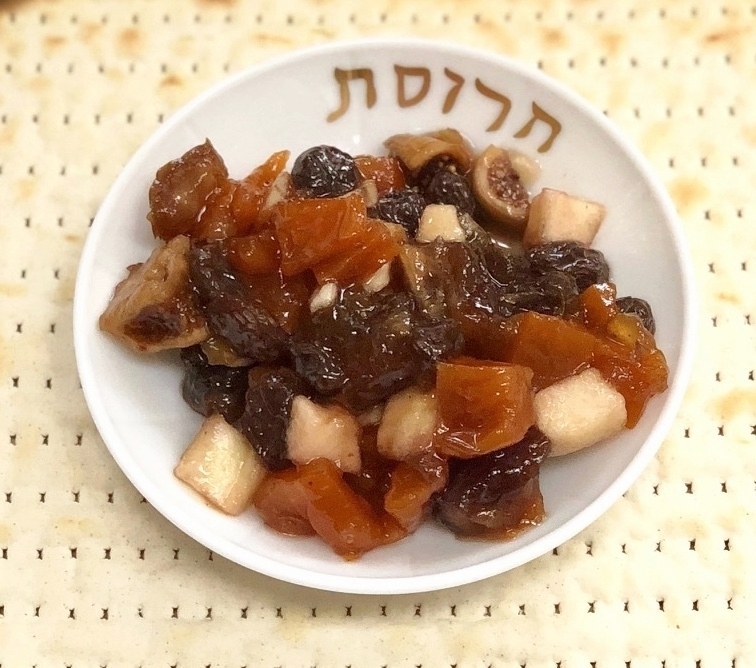 Although I usually like to cook new foods and experiment with recipes, when it comes to the Jewish holidays I more or less prepare the same things my mother and grandmother served in their day. For the first night of Passover that means chicken soup with matzo balls, roasted turkey, chremslich and macaroons. And several side dishes, such as braised leeks and tomatoes, roasted carrots, some quinoa dish or other -- and so on. But I can't help myself, even for this very traditional meal -- I always add a new dish or two or three. Sometimes it's a side dish, sometimes a dessert. Sometimes I'll add an additional haroset to my usual one. That's it for this year. Here's the one: Dried Fruit Haroset with Ginger and Coriander. NOTE: I understand that not everyone eats sesame seeds during Passover (sesame seeds are kitnyiot). Please follow according to your tradition. The haroset is delicious even without the seeds. If you prefer, scatter the top with chopped toasted almonds. Combine the figs, dates, apricots and raisins in a bowl. Add the ginger, coriander, preserves and wine and mix until the ingredients are evenly distributed. Let the mixture stand for at least one hour before serving. Sprinkle with sesame seeds and serve. For kids, finding the afikomen is the most thrilling part of the Passover Seder. I can remember running through my grandma’s house searching for that half of a matzo. My cousin Leslie and I would look together. (We did everything together.) And when we found the matzo we screamed with joy and then when my Uncle Irving fit it together with the other half, we shared the prize (which I think was a piece of candy). I remember my daughters yelling and jumping up and down with delight when it was their turn to find the afikomen. This is the way it’s supposed to be. When the children find the half that some grownup has hidden they all shriek and shout, as you can see by the expression of utter joy shown by my grandson Zev in the first photo. The fitting together part is my husband Ed’s task and you can see (in the other photos) that he’s pretty much thrilled with it and jokes about it with the kids. Sometimes he purposely gets out the wrong half so the afikomen won’t fit. Sometimes he pretends he’s eaten the other half. Or tries to fit it together sideways. Of course Passover, beyond the tradition of finding the afikomen, is all about matzo. Which suits me just fine because I think it is one of life’s most delicious foods. Fresh matzo. Crispy, toasty. Just plain, smeared with butter or cream cheese. Or topped with leftover chicken or chopped liver. Or strawberry jam. During Passover I use a matzo to make a crust on top of spinach pie (the same recipe I use year round with a phyllo dough crust). I even make toasted cheese sandwiches with matzo (place slices of cheese on top of the matzo and cook in a toaster oven). But the family favorite is matzo brei. For breakfast, brunch and an occasional dinner. Is there anyone who doesn’t like matzo brei? Ed and I still argue over whether matzo brei is better soft (me) or crunchy (him). I think this is a common theme among matzo brei enthusiasts. Although we usually eat plain old matzo brei, I tinker with the recipe. Of course. That’s what I do. And although we come back to the original time after time, sometimes it’s nice to have a new version. So here is one that we liked.